2007 WSOP Main Event Day 1d wrapped with Vinnie Vinh making another disappearance, Vinnie Vinh’s chair making another reappearance, Josh Evans ending as the big stack (240,000), and lots of big name pros advancing to Day 2.
Notable Day 1d stacks include Cindy Longoria, a woman who sounds like she’d be hot, at 166,000, Ted Forrest (150,000), Anthony Reategui (140,000), Chip Jett (123,000), Thor Hansen (114,000), 8-time 2007 WSOP casher Michael Binger (94,000), Carlos Mortensen (85,000), Bill Edler (80,000), Jon “Pearljammer” Turner (61,000), Peter Feldman (60,000), Gavin Smith (58,000), Daniel Negreanu (50,000), Layne Flack (49,000), Godsmack’s Sully Erna (43,000) and Prahlad Friedman (at right) (32,000). Vinnie Vinh’s chair ended up the day with 3,200 in chips and was seen getting a ride back to his Palms fantasy suite in the Bodog Players Bus, which, unlike cheap hookers and fat ugly people in jean shorts, has reportedly been banned from the Rio property. Oh yeh, Backstreet Boy A.J. 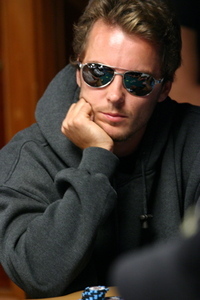 McLean was here yesterday playing the Main Event or maybe it was Jeff Goldenberg of the WSOP Academy poker camp. Too close to call. Whoever it was, he’s out. 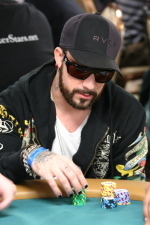 In related news, apparently someone named “shorton” at PokerNews.com knows their Backstreet Boys songs. The big stacks going into Day 2 are international man of mystery Tinten Olivier (270,000), the aforementioned Josh Evans, Dag Martin Mikkelsen (236000), and Tom Bernard (220,000). For more on yesterday’s events, head over to Tao of Poker.